Mythology/History – Tibetan Quartz comes from high in the Tibetan Mountains and due to the altitude and it is said that only the Tibetan people are able to mine for these crystals. Legend has it that the crystals were placed on this earth by ‘star people’ millions of years ago in order to keep the ancient wisdom hidden until a time would come that man would be ready for the knowledge. the Himalayas are considered to be one of the holiest or most spiritual places on earth and so any crystals coming from this area will have a very high vibration. Tibetan Quartz Crystals can be used to bridge the gap with the ancient cultures of the east, enabling us to make contact and then when ready to access the knowledge which centers around healing and spirituality. Tibetan Quartz is a great aid when you are going through times of fasting or abstinence particularly if the reason behind this is for spiritual progression. Tibetan Quartz have a wonderful grounding and centering energy and can assist you in reaching a point of total centering so that you are better able to channel or use energy. Tibetan Quartz are known to carry the vibration of’OM’ within them, and a focused user can attune themselves to this vibration and by doing so raise their own vibration to the same level. 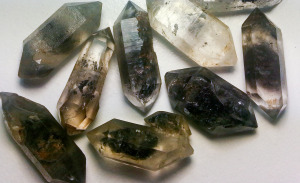 Due to the black inclusions (normally Black Tourmaline) found within Tibetan Quartz which is sometime referred to as Tibetan Black Quartz due to this, these stones are also very protective and grounding. People who work with energy or do a lot a meditating love these stones as they do not have to use a protection stone or grounding stone when doing work with them. Healing – Fasting and cleansing the body, master healer, immune system, brings balance to the whole person, aligns the subtle bodies. Can be used in all meditations can be held or place on any Chakra that needs it. Please note that the Tibetan Black Quartz is of a very high vibration and I would recommend using is smaller amounts to begin with and monitoring your reaction.